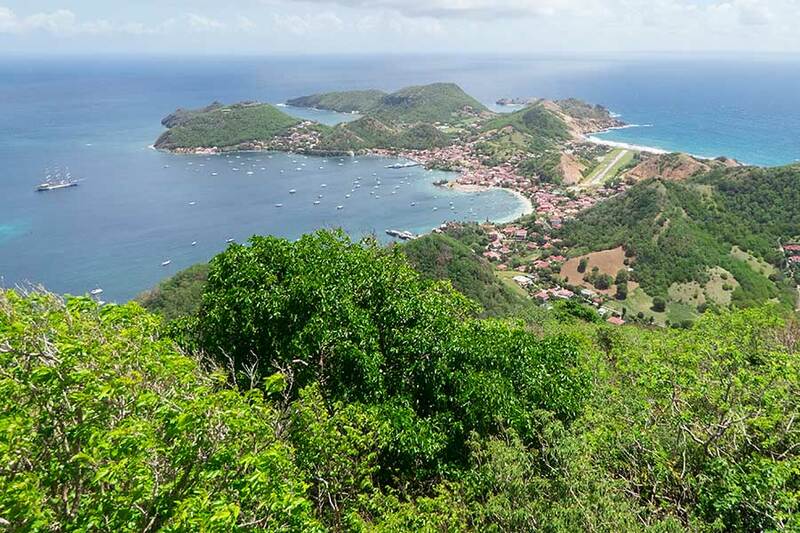 These small islands, part of the French departement of Guadeloupe, are popular with cruisers and tourists alike. For us, they were our first introduction to the French West Indies. The most populated (maybe a couple of thousand locals, most with Breton roots) island, Terre-en-haut, has a large anchorage off the main town, Le Bourg, and others nearby. We had been warned that everywhere here is busy so picked up the first available mooring we saw, off the Pain de Sucre beach. It's a bit far from the town but much quieter. We needed to do Customs clearance (on a computer in a wine bar, this being France!) and the seas were quite choppy with gusty winds so we walked the mile and a half into town, leaving our dinghy on the beach. There are few vehicles on the island other than scooters (which the locals use) and golf buggies (for tourists), and no buses. The town is pretty and busy when hoards of day-tourists visit from Guadeloupe. It's very much like a French Mediterranean fishing village resort might have been a few decades ago. The next day was less stormy so we took the dinghy around the headland to Le Bourg to do some shopping. Although a small town, the direct link with Europe is obvious in many ways - the architecture, driving on the right, recycling bins - and the shops had plenty of treats for us, such as croissants, charcuterie, French wine, etc. 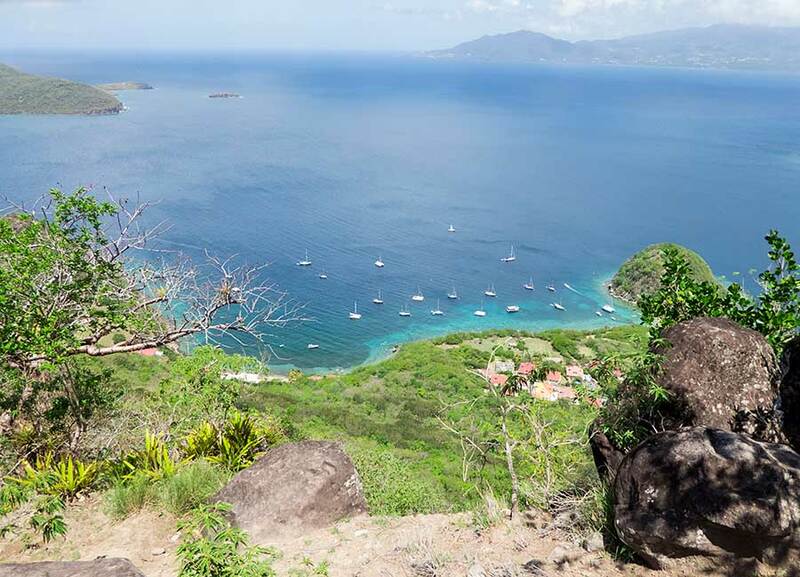 The highpoint of the island is Le Chameau, a hill of just 320 metres. It was a hot walk up a paved road through dry forest. On the way down we found a path that took us on a steep scramble down in the shade. Yachts of all sizes and nationalities came and went. 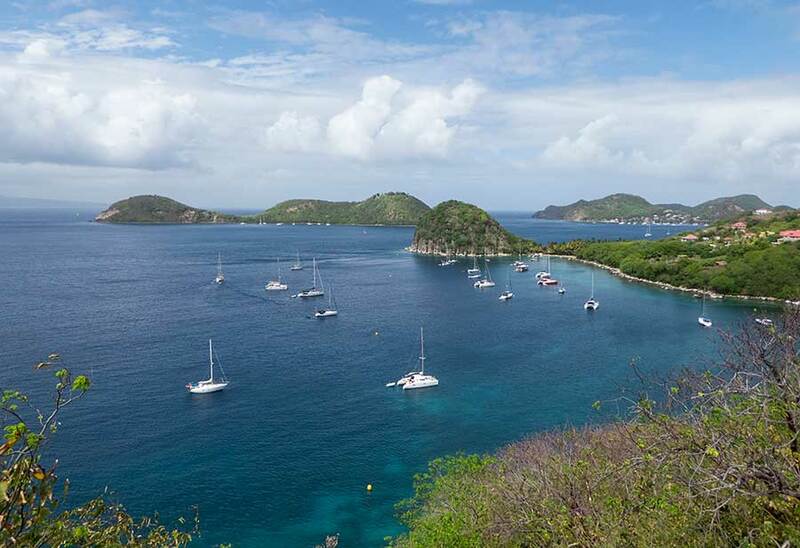 Many are charter yachts heading south from their base in Guadeloupe but some "classic" and other yachts are now making their way north to Antigua for the Sailing Week and Regatta at the end of this month. The snorkelling was quite good near the boat, with lots of fish ( but not so much interesting coral), so we were happy to while away a few days there, sometimes visiting the local hotel bar for a snack lunch.